May | 2012 | That Was an Accident! How The Hell am *I* Alive? Usually, I’m the only one dead. 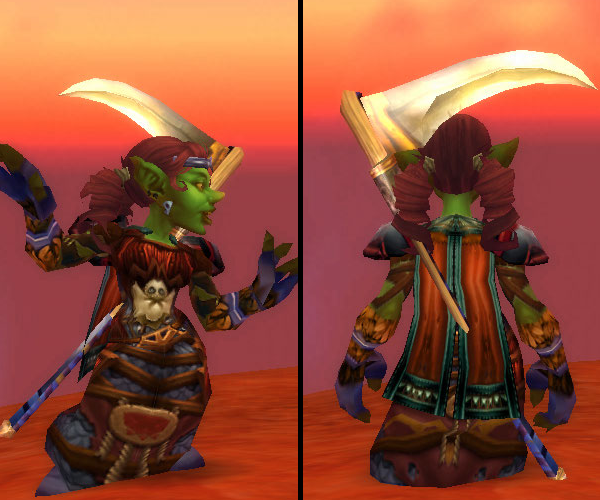 This entry was posted in For the Horde, Baby!, Goblins, OMGWTF, Thermalix, World of Warcraft and tagged darkside of whimsical, deadmines, death and destruction, goblins, guild, oh the goblinity, thermalix, world of warcraft on May 30, 2012 by Prinnie Powah. Thoughts: I almost named this “Prinny Prinny Princess.” Given my love of purple things and the fact that I had Melmorta’s Twilight Bow, this set was, perhaps, inevitable. Mostly Skettis/Netherstalker, but I don’t like the weird top that belongs to the set (it looks like it has … support problems, and I just can’t imagine bouncing my way comfortably through Grim Batol), so I picked up the Felstone Chain Vest instead. I like pretending I’m a Pretty Trade Princess! I got so close on Kezan, but that whole thing with Deathwing and Gallywix kinda put the kibosh on that plan. 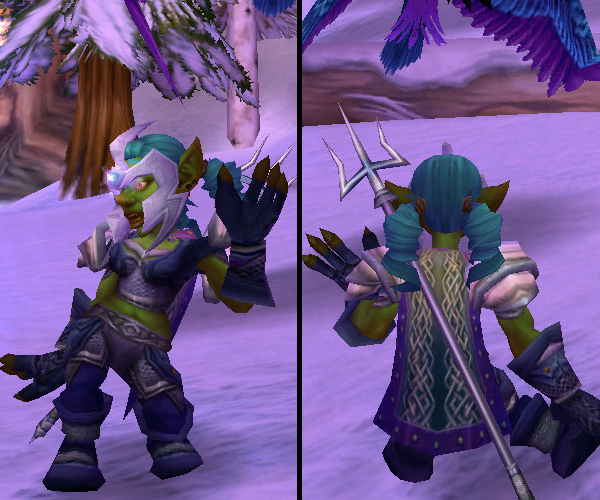 This entry was posted in For the Horde, Baby!, Goblins, Mail, Thermalix, Transmog, World of Warcraft and tagged goblins, hunter, mail, thermalix, transmogging, world of warcraft on May 30, 2012 by Prinnie Powah. Thoughts: Mostly Nexus-Strider pieces. I’m sad to admit that I put this together to match Cerulean (formerly known as Aotona) the blue parrot, seen in part in one of the cropped shots above, hence the daft name. 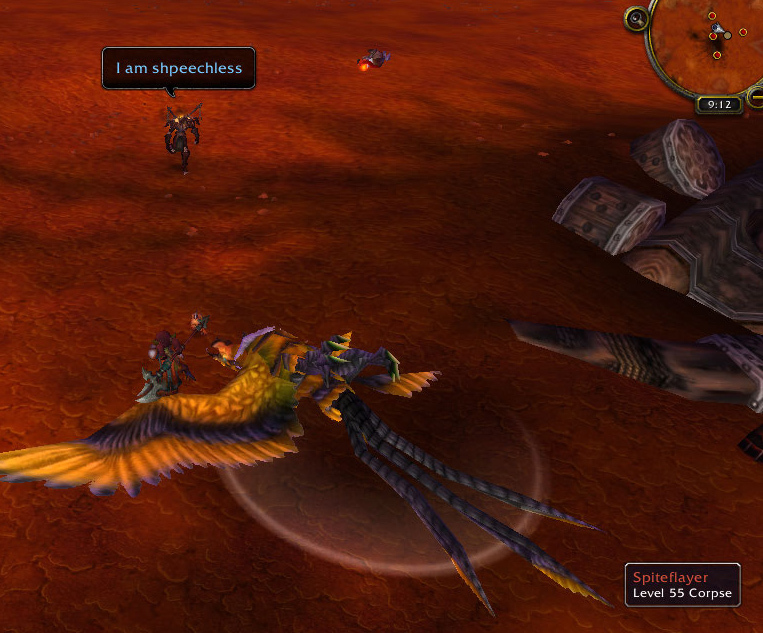 I trekked out to Shattrath for the express purpose of wasting Justice Points on the Storm Master’s Helmet. I spent a lot of money on that darn haircut and I don’t intend to stick it under a helmet! I want to find the Cryptfiend Slayer bow eventually, but it isn’t a high priority. 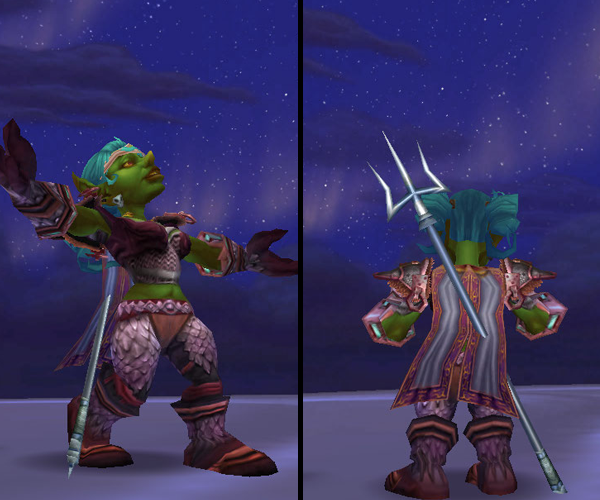 This entry was posted in For the Horde, Baby!, Goblins, Mail, Thermalix, Transmog, Versebelg, World of Warcraft and tagged goblins, hunter, mail, thermalix, transmogging, world of warcraft on May 29, 2012 by Prinnie Powah. As I more or less finish sets and get/edit pictures of them, I’m going to stick them on the Transmoggination Trove page. This way, I can look back and weep at all the time and money I’ve spent on this. I mean, weep tears of nostalgia. Yeah. Thoughts: I called this one the “Pretty Respectable” set because after the “Mustard, Ketchup and Pickles” fiasco, it did seem pretty darn respectable. It seems to suit Umberpaw, and is nice and warm for those hours spent in the middle of The Storm Peaks. The top is a recent switch (former one seen here, don’t recall the name), and it doesn’t match the Gryphon Mail Gauntlets as well, but does work better with the kilt. Does this count as a utilikilt? No, probably not. I haven’t mentioned the wrists because you just don’t see ’em. 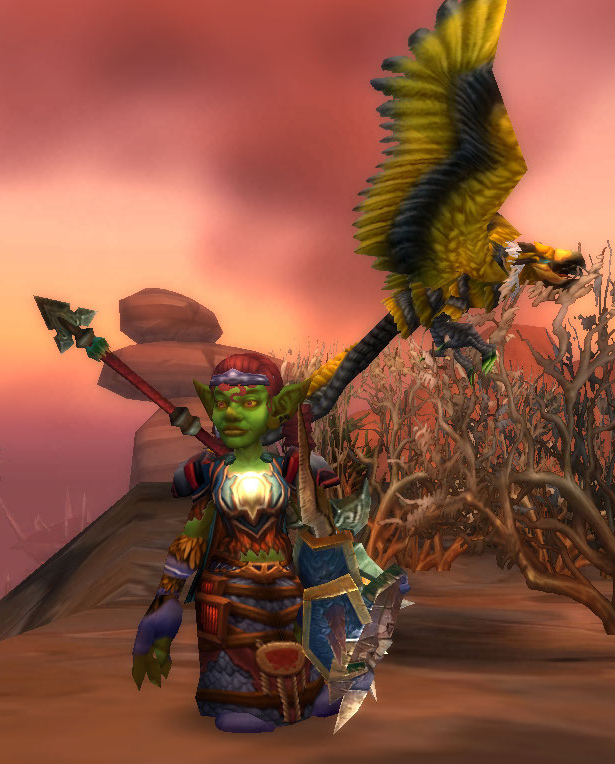 This entry was posted in For the Horde, Baby!, Goblins, Mail, Thermalix, Transmog, World of Warcraft and tagged aftershock waistguard, chief brigadier's pauldrons, goblins, grunt's cape, gryphon mail gauntlets, gryphon mail greaves, hauberk of the furious elements, hunter, mail, renegade circlet, rushing storm kilt, thermalix, transmogging, world of warcraft on May 29, 2012 by Prinnie Powah. When I racechanged Versebelg the Troll into Thermalix the Goblin, I debated tossing my engineering, which was then around 250/525. I wound up deciding to sleep on it/forget about it. 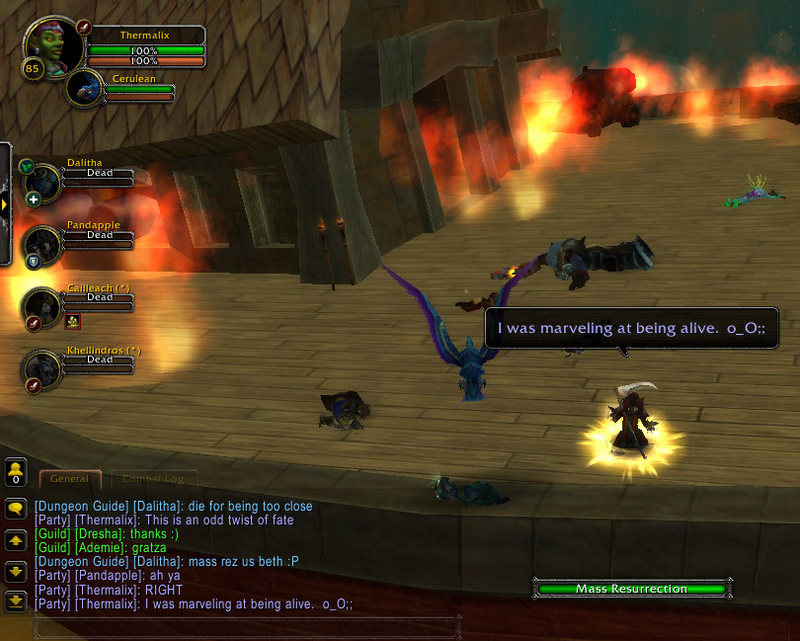 I’m glad I zoned on the matter, for I recently started leveling it again, and I now have … a FLYING MACHINE. YAY! This is a vast improvement over my old wind rider (the poor guy needed dental work). It’s also an upgrade over the albino drake I was using. If I had quit engineering, I’d have been that much farther away from a mount held together with duct tape! 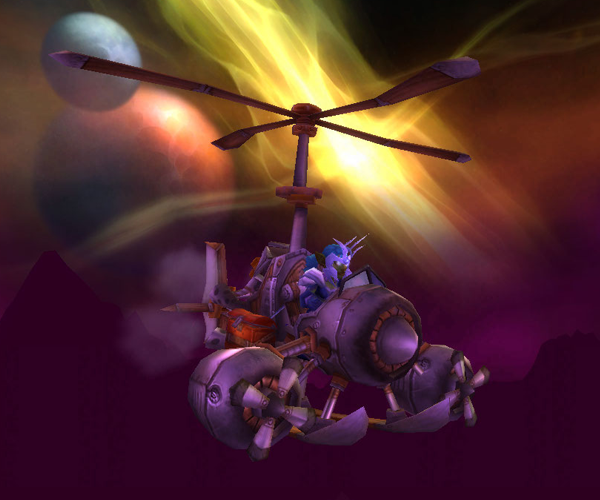 This entry was posted in For the Horde, Baby!, Goblins, Thermalix, World of Warcraft and tagged engineering, flying machine, flying mount, goblins, hunter, thermalix, world of warcraft on May 29, 2012 by Prinnie Powah. 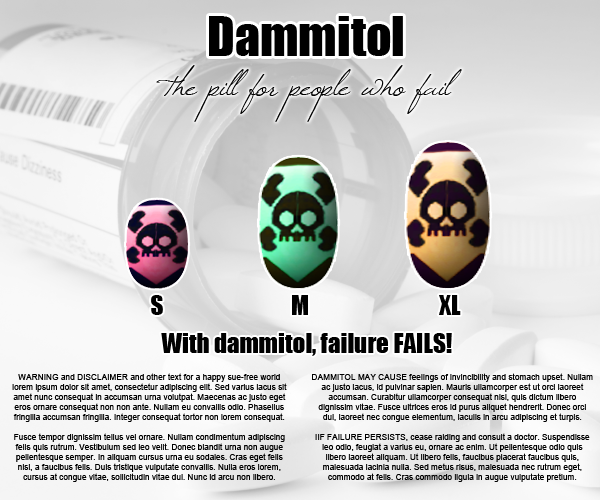 DAMMITOL – the pill for people who fail! But I couldn’t. Everyone saw me wipe constantly – guildies, PUGS, you name it. My friend from that other server told me about a new medicine that can help solve problems like mine. I did my research, and I’m sure it’s the right one for me. 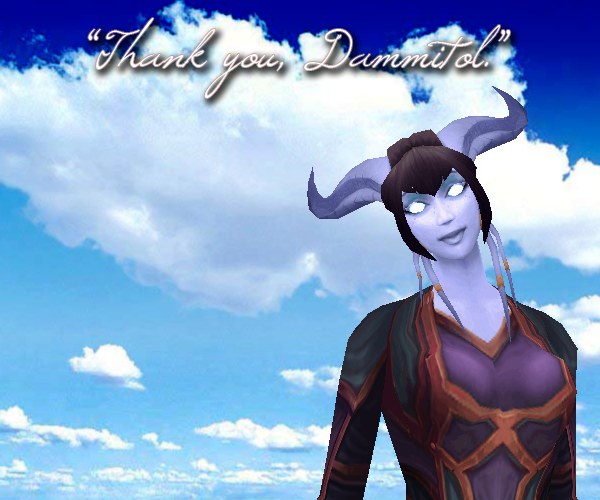 Thank you, Dammitol. Now I can raid again with confidence! Maybe Dammitol is the right thing for you too. 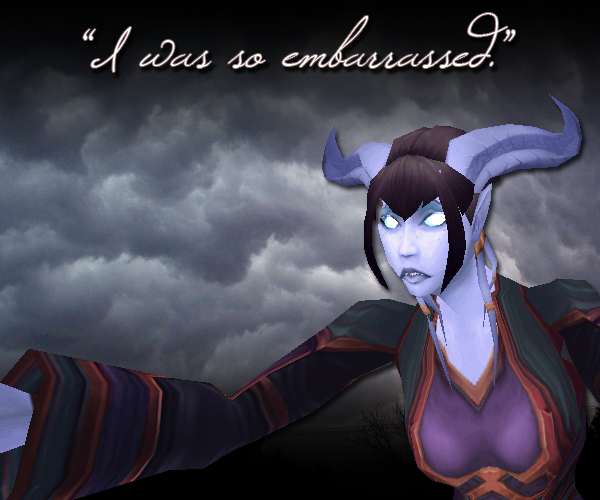 This entry was posted in Draenei In Space, OMGWTF, World of Warcraft and tagged bored out of my gourd, dammitol, fail, raids, world of warcraft on May 26, 2012 by Prinnie Powah. This is the LAST TIME, I swear! Sunblood and Caliverne think Thermalix has a rare addiction. 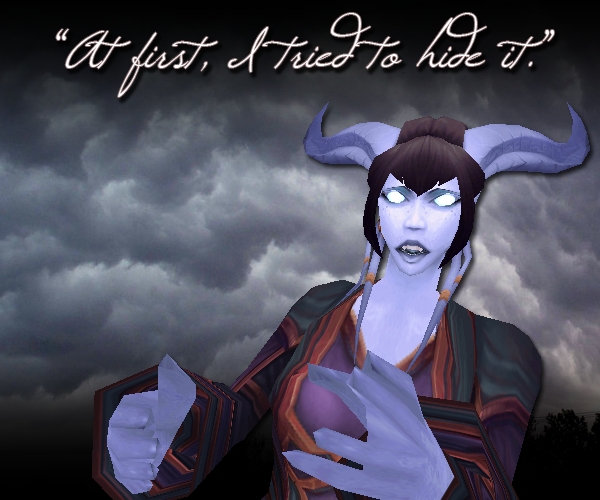 She doesn’t, really – but it is true that if you camp rares, you’re probably mental on some level. If you read up a bit on Spiteflayer, you find that because 1.) 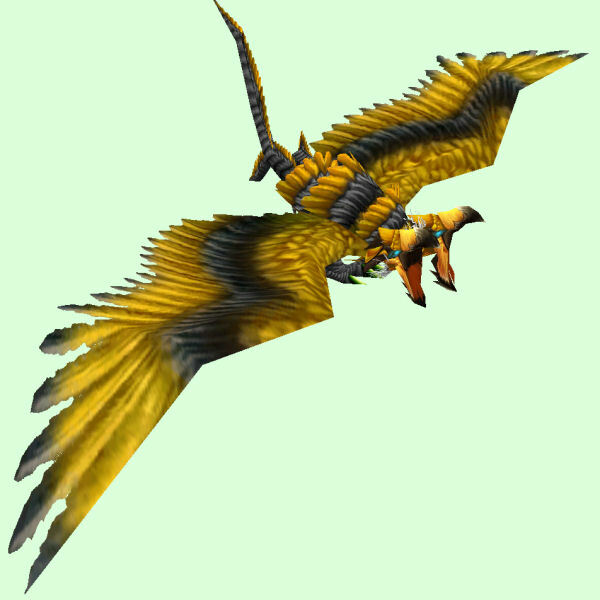 It’s a carrion bird in banana yellow, and 2.) It’s located in the Blasted Lands, which is generally not a top destination, nobody camps this thing. Most folks show up, it’s there, they tame it, story ends. I, however, named this blog “That Was an Accident!” for a reason. When Thermalix showed up, Spiteflayer was (wisely, in hindsight) not there. Caliverne showed up, flipped his Titanium Seal of Dalaran in the air, and pronounced that the camping effort would be a success. And so they waited. And waited. They practiced methods of yanking birds down to the ground (Thermalix flying in front of them, making /rude gestures = failure, Caliverne doing some fancy falling from the sky and daring warrior skill move = success). At last, two hours in, Spiteflayer showed! As she ran towards her target, Thermalix pulled out her bow to slay some of the cultists who were chasing her. While they couldn’t kill her, they could make the tame take longer by smacking her lots. Only problem here was she had not, in fact, retargeted like she thought she had. While consoling herself with the fact that at least it wasn’t like she shot Skoll in the face, the whole thing was a big OH SHEEYIT moment. Caliverne and Therm decided to come back in about four hours, since they did, after all, know the exact moment Spiteflayer perished. Let’s just say that this time was waaaay past Therm’s normal bedtime, and just to make EXTRA CERTAIN that absolutely NO ACCIDENTS could occur, she removed ALL of her weapons. Can you punch a bird out of the sky? Not when you’re as short as Thermalix is. Just at the four hour mark – just as Spiteflayer was due to appear in the skies – my internet connection died. Well, sheeyit, son. It could not be revived, and I had to pass out anyway. Failure! Failure! Such epically unepic failure! Fortunately, when my internet connection was functioning the following morning, who should be in the area but Spiteflayer? See, nobody camps this after all. All’s well that ends well, but seriously, don’t shoot the damn thing you’re trying to tame. Just sayin’. Eventual success is still success! This entry was posted in For the Horde, Baby!, Goblins, OMGWTF, Thermalix, World of Warcraft and tagged bored out of my gourd, camping, darkside of whimsical, goblins, guild, hunter, oh the goblinity, pets, rares, spiteflayer, thermalix, world of warcraft on May 23, 2012 by Prinnie Powah.